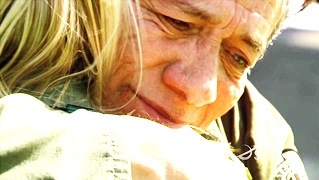 Adm. Adama hugging Starbuck scene (screen shot/cropped), Battlestar Galactica, 2009. (http://blazingangel.tumblr.com). I guess that we as individuals each have tells in telling stories, including our life stories. Certainly all writers have a tell, a catch phrase or common set of words that use in telling a story or in setting a scene. All artists have a unique signature, a nuance within a particular style or genre that sets them apart from someone painting by numbers. Sometimes, at least for me, it takes heavy doses of a writer’s style or of someone’s art for me to see the unique tells in the telling. Firefly series opening logo, July 21, 2012. (Adamwankenobi via Wikia.com). That’s been so true for me in watching entire TV series through Netflix over the past two years, whether through DVD or online streaming. Since the spring of ’10, I’ve watched, in order and their entirety, Star Trek: DS9, Star Trek: Enterprise, Star Trek: Voyager, House, Firefly, Heroes, Breaking Bad, Dexter, Six Feet Under, Oz, Eureka, Warehouse 13, Battlestar Galactica, Bones and Fringe, mostly through Netflix. Now, some of these shows I’d seen plenty of when they were regular series, especially DS9, Six Feet Under, House and Oz, while I viewed most of these series for the first time. There’s something different about watching a TV series all at once than watching it once a week in twelve, twenty-four or twenty-six episode blocks year by year. Especially with unlimited streaming. Earlier this year, I watched all seventy-six episodes of Battlestar Galactica over a six-day span in April, including the first two seasons between Saturday morning and Sunday evening Easter weekend (see my post “Battlescar Galactica” from June ’12). In watching so many episodes, you quickly sense the rapport being actors, the plot and its direction, and the tells about a particular episode or season of a show. In watching DS9, I learned that whenever Quark would mention Dax’s relationship with a Gallamite (a race with a transparent skull) or a Tholian ambassador, I’d learn something revealing about one of the main characters, especially Dax or Quark. Only, there may’ve been only one scene in 176 episodes in which there was a Gallamite character, and none for a Tholian ambassador. With House, if the “sarcoidosis” diagnosis came up before the last segment of an episode, it was always wrong, but if it came up in the last segment, it would occasionally be correct. The writers obviously knew that sarcoidosis was such a general diagnosis that it could mean nothing in nearly all the show’s mystery illnesses, revealing the desperation and pressure the characters felt in finding the right diagnosis to save someone’s life. 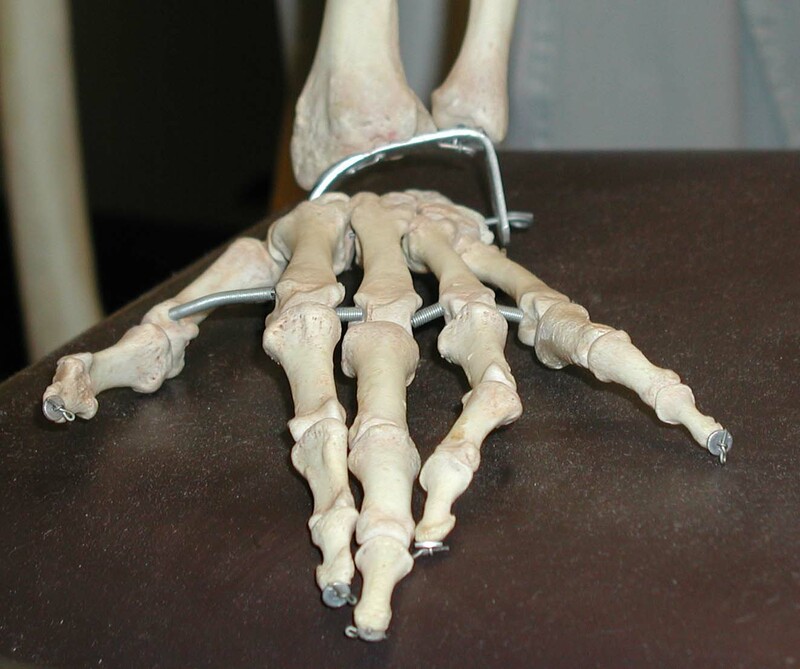 Bones in the human hand (from authentic human skeleton), March 25, 2004. (Raul654 via Wikipedia). Released to public domain via GNU Free Documentation License. For other shows, it could be a word, a line, an appearance of a sign or character even. For the first five seasons of Bones, the tell for Brennan’s emotional state — or lack of one — was how she’d say “phalanges,” “distal phalanges,” or even “ungual phalanges.” Brennan wiggled her “phalanges” with delight for babies and kids, and examined microscopic details of dead peoples’ phalanges with scientific coldness otherwise. For the sci-fi western Firefly, lines like “the money was too good” and cursing in Mandarin Chinese illuminated the contrast between haves and have-nots of twenty-sixth century humans, between technological advances and moral devolution. There’s also Fringe’s opening with changes in colors signifying alternate universes and timelines. Not to mention Breaking Bad’s opening scenes foreshadowing how a season would conclude, or the use of light-skinned or biracial actresses as either technically or ephemerally brilliant characters on Fringe, Warehouse 13 and Bones. No matter how the characters felt, how dire the situation, or how triumphant the moment, it was the line that showed how precious the connections we have and need to have with each other and with our humanity. I think that the way I can — we can — watch movies, TV series, read books and articles, look at art, and listen to music through these tells can tell me a lot about a writer, a musician or an artist. But it also tells me a lot about me. Not just that I’m a little weird. I’m also a sucker for a good story, one that is a bit ironic, a tad asymmetrical, that is quirky and epic, unique and yet mundane. A story that mirrors my life is one that tells me about me, at least in part. 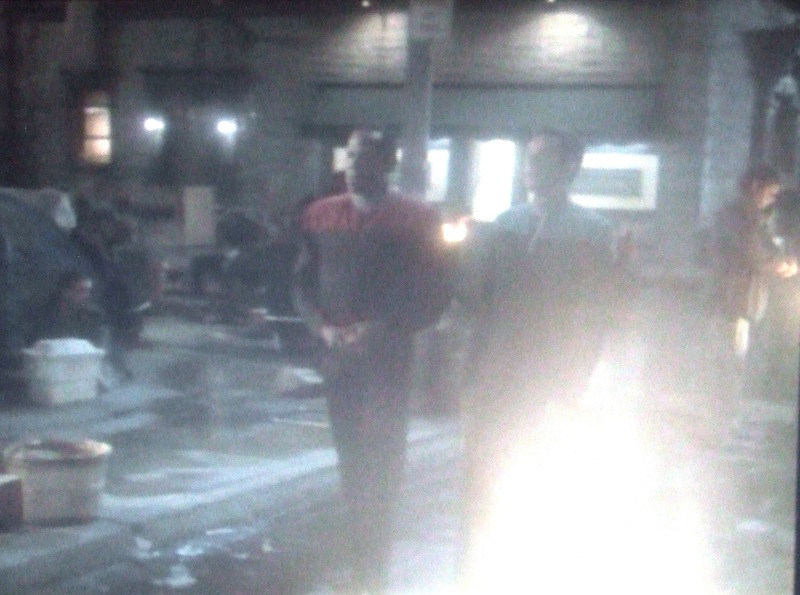 Star Trek: DS9, "What You Leave Behind" Screen Shot, November 30, 2010. Donald Earl Collins. Qualifies as fair use under US copyright law because this screen shot is used for limited illustrative purposes in identifying the theme of this article. I just finished re-watching the Star Trek: Deep Space Nine series via Netflix, probably one of the more underappreciated Star Trek franchise shows, not to mention underappreciated during the good-old ’90s. Since the middle of June, through the death of my sister, teaching, writing and revising different pieces and Boy @ The Window, I re-watched all 176 episodes (although, admittedly, I’d missed most of the seventh and final season in ’98-’99, between travel and a long job search). This was easily the Star Trek series with the best acting, the most interesting story lines, and the most complicated in terms of moral choices and the complexity of humanity (and the universe more broadly). I gained an even greater appreciation for Avery Brooks — who’d previously been known as Spenser: For Hire’s Hawk character — Terry Farrell, Alexander Siddig and the rest of the cast as they grew the show over the course of seven years. But you can’t find the series anywhere in the cable TV universe. It’s as if it disappeared in a singularity — a black hole for the layman. Even Star Trek: Enterprise, a terribly written series with mediocre acting on its best days, can be found in rerun syndication. I can’t help but think that Avery Brooks’ position as the lead actor in the series has a little something to do with my inability to find DS9 on TV. The lead cast, dealing with complicated issues in ways that some have written would’ve made Gene Roddenberry spin like a top in his grave, may have made many uncomfortable in our intolerant of anything serious times. Race, genocide, oppression, the darker side of human — maybe even alien — nature, the idea that not everything in the distant future will be paradise. All too much for those who prefer their liberalism brewed in a ’60s era coffee machine. The last five months of using Netflix to relive a piece of ’90s culture was wonderful. Watching classically trained theater actors on the small screen, watching religion, science, race and conflict brought to together so nicely. It made me want to give James Lipton a call to get him to interview Avery Brooks, if he hasn’t done so already. After watching the series finale last week, I felt like I lost a dear old friend again. Last night, I was reminded of the power of entertainment, Netflix and how art and life converge. I was watching episodes of Star Trek: Deep Space Nine when a familiar two-part episode, “Past Tense,” began. I had planned to skip it, but once I remembered the story line, I watched it again, for the first time in at least thirteen years. The crew of the Defiant, in attempting to beam down to 24th-century San Francisco, find themselves in the year 2024, in a San Francisco and an America turned upside down by bad economic times. Two members of the crew, played by Avery Brooks (Cmdr. Benjamin Sisko, or “Hawk” for those of you who remember Spencer For Hire on ABC from the ’80s) and Alexander Siddiq (Dr. Julian Bashir, or more recently, on 24 and in the movie Kingdom of Heaven) find themselves in one of many government-run concentration camps for the homeless and unemployed. This just days before an uprising that exposes the truth of an unjust system of economic neglect and government cover-up to the nation and world. It’s not that Americans don’t care, according to Brooks’ Sisko and Siddiq’s Bashir, it’s that “they’ve given up,” they’ve “forgotten how to care.” I paused the DVD and thought about that statement as I watched Tea Baggers’ Christine O’Donnell and Carl P. Paladino win in Delaware and New York, Kevin Powell get slaughtered by Ed Towns in Brooklyn, and Charles Rangel paste five other opponents in Harlem. Not to mention young Turk Adrian Fenty losing to the ol’ Blacks network and Vincent Gray in DC. Last night proved to me that most Americans simply don’t know how to care about anything except for someone who looks and sounds like them, whether that politician represents their interests or not. Some may care, some may not, some may even have forgotten how to care. But way, way too many of us get caught up in style over substance, in grandiose grandstanding over a sensible platform, over a good handshake rather than someone giving us a real hand in our lives. We are as shortsighted as a roach, running just hard enough to not get stomped on, but not seeing that the person with the size 14-4Es has two feet, not one. As Polyanna-ish as Star Trek is, that two-part episode from season three of Deep Space Nine presents a stark and nasty future that is already beginning to manifest itself right now. All because we’ve allowed our bigotry and fear to lead us in the direction of creating a self-fulfilling prophecy.